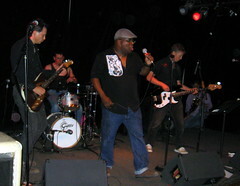 Barrence Whitfield, the R&B belter from Boston, reunited for the first time in 24 years with two of the original members of his band The Savages for three shows in New Mexico this weekend. I caught the one in Santa Fe last night and it was a pounder as Mr. Kaiser would say. 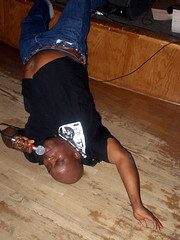 Here’s a phone interview I did with Barrence last week, with some photos I took last night. 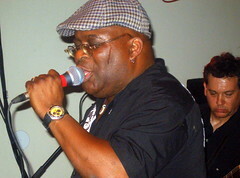 particular exclamation has become something of a trademark for Boston soul shouter Whitfield. It is the name of one of his albums, and he often uses it to punctuate the messages from his Twitter account. But most important, you can hear him scream, “Ow! Ow! Ow!” when he really gets going onstage, pounding some song into submission. shows represent the first time in nearly a quarter century that Whitfield will play with original Savages guitarist Peter Greenfield (now a Taos resident and guitarist for a garage band called Manby’s Head) and bassist Phil Lenker. and his Savages were known as one of the wildest acts ever to hit the East Coast. certificate gives his name as Barry White, but when he began performing, he took the name Barrence Whitfield to avoid confusion with the ’70s soul giant. first 45 rpm record he bought was “I’m Losing You” by The Temptations. His first album, he said, was something by Paul Revere & The Raiders. But his first band, he said, was a Funkadelic tribute band called Funkasonics. Whitfield, in high school at the time, played the drums. credits Greenberg with giving him an education in a musical form that is a huge influence in his music: rockabilly. “I didn’t listen to it much before I met Peter,” he said. “Oh, I knew Jerry Lee Lewis and some others. But Peter made me listen to a lot of old rockabilly like ‘Wild Hog Hop’ by Bennie Hess.” Whitfield then imitated Hess’ hog snorts that grace the song. a few more albums. In the early ’90s, he decided to stretch musically —to show that he wasn’t just a crazy guy who could shout like Little Richard and James Brown. He wanted to make a country album. A friend introduced him to singer-songwriter Tom Russell, who collaborated with Whitfield on two records. Cincinnati studio to do a new Savages album. The band’s first album, with a bunch of added live tracks, is soon scheduled for rerelease.